ISDT 1951: George Wilson asks Where do we go from here? A Backward Glance at the 26th International Six Days’ Trial – and a Thought for the Future. IT is inevitable that after each International one seeks to compare it with previous events. 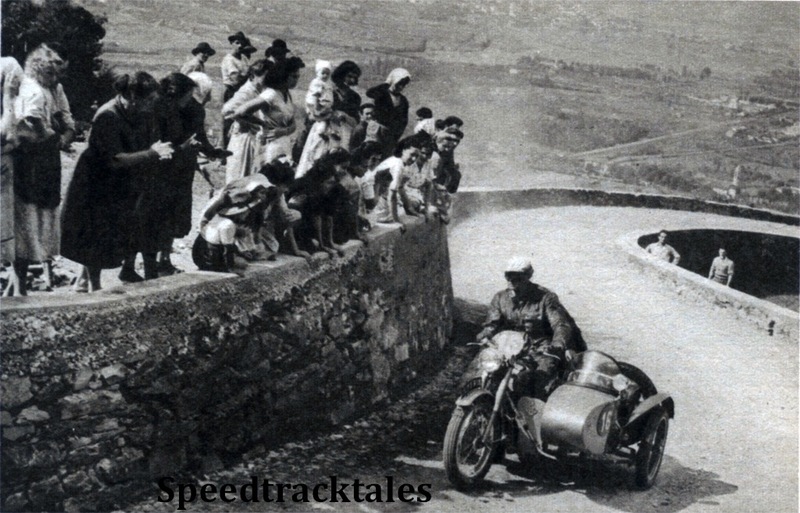 One recalls the reports of the lurid 1932 Merano “GrandPrix,” the Oberstdorf event in 1935, the San Remo event in 1948. One might even add to the list last year’s trial at Llandrindod Wells. And, so far as severity is concerned, the event just concluded in northern Italy was, by comparison, fairly easy. 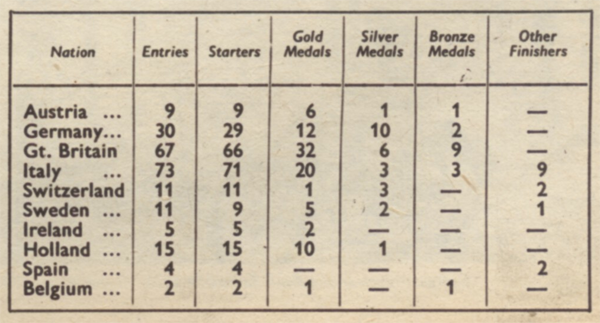 However, this in no way detracts from the British win in the major contest – that for the International Trophy. Neither does it diminish the brilliance of the Netherlands victory in the Silver Vase contest. Recalling the Anglo – Dutch Trials, which began before the first World War, and were forerunners of arduous long-distance events, I am as pleased about the Netherlands success as I should have been about a British Vase victory. The team, comprising P. Haaker, C. van Rijssel, and H.Veer, all experienced I.S.D.T.men, were mounted on 250c.c. Jawas. In a review of last year’s event, I made the point that British riders are the best in the world. That statement was made in no sudden flush of patriotic pride; it was, and still is, a clear-cut, indisputable asseveration of truth, clearly borne out by the fact that our Trophy Teams have never been beaten in a post-war International. This year they won against great odds, with the scales weighted against them from the outset. They arrived, as I mentioned in the report of the opening stages, to find that they were installed in an hotel crowning a 4.000ft mountain. The nine-mile route to the start was a writhing, narrow horror which had be to covered morning and evening. They had to be off early in order to reach the start in time and, in the evening, tired and disheveled, they had to wait about at the finish for transport to take them back. This is by no means a minor detail and was one of the many minutiæ which combined to increase the mental stress of riders engaged upon an Herculean task – and representing their country while doing so. In case it should be thought that this “worrying” business is being overstressed. I might mention that two riders – one of them a member of the British Trophy Team – were violently sick on the way to the start on the first day. This sickness they themselves attributed purely to “first-day jitters.” To quote another instance – Fred Rist, Trophy Team captain, arrived at Varese in a neatly fitting suit which, at the prize-giving, looked as though it had been made for some one twice his size – so much weight had he shed during the six hectic days. Another nerve-racking aspect for our teams was that they were billeted so far away from the headquarters hotel, where the day-by-day results were calculated and issued, and where the jury met each night to discuss protests and any other irregularities. 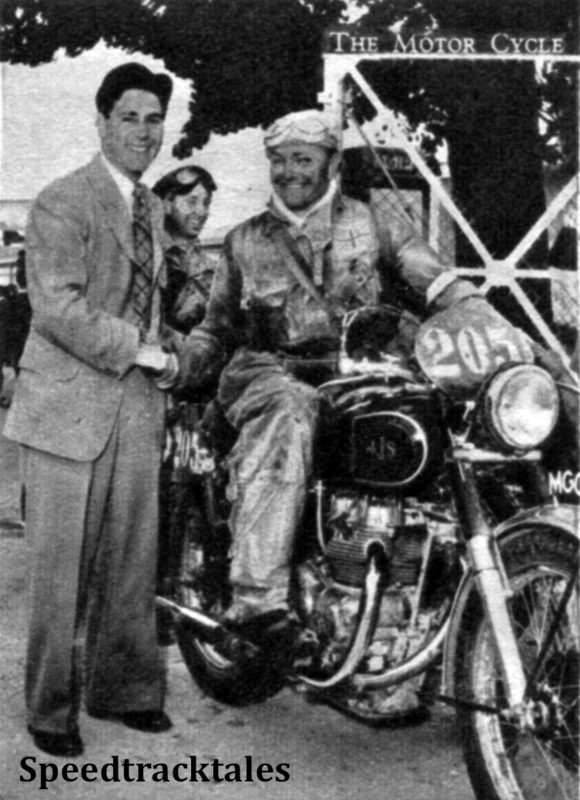 By Friday, team manager Len Heath had covered 400 miles travelling between the Campo dei Fiori (the riders’ hotel) and Varese. Major Watling, representing British interests on the jury, was at the headquarters hotel and, in a way, cut off from the riders whose interests he was safeguarding. He was one of the most severely harassed of all officials at Varese! Do not let it be imagined, however, that a dog-in-the-manger attitude was adopted in the face of this and many other onerous difficulties. On the contrary, once they were accepted and the trial was underway, the snags were taken for granted as part of a tough itinerary. The whole question of the inadequacy of the accommodation, incidentally, boils down to the plain fact that Varese, picturesque Italian parish though it is, was not at all well-suited to quartering, compactly, the numbers involved in a large-scale I.S.D.T. 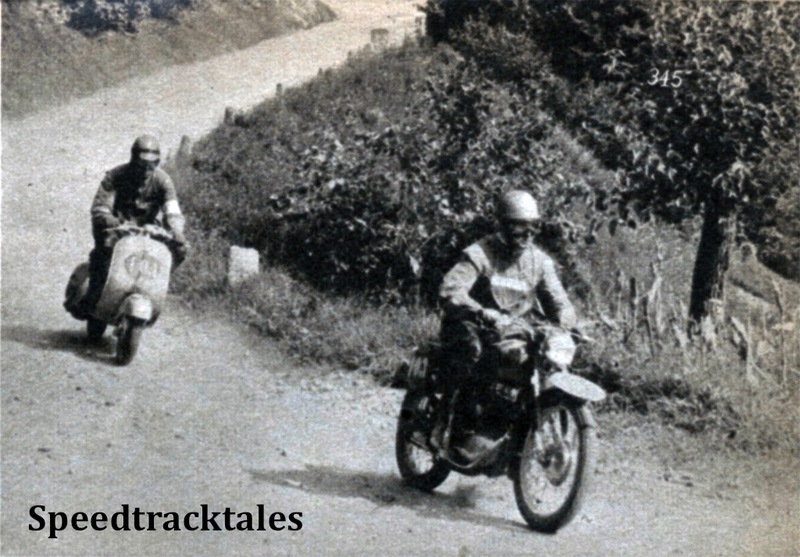 However, as to the course itself: in nearly all respects it was excellent, embracing for the most part little-used, loosely surfaced tracks well away from other vehicular traffic. Italy, incidentally, is an excellent country in which to hold the International Trial because excited towns people and villagers line the streets directing competitors on corners and holding up traffic travelling in the opposite direction to the course. No one seems to mind being held up in this way. On the contrary, it is all regarded as part of the fun!A surprise was that this year’s route was extremely flat. True, heights in the region of over 4,000ft. above sea-level were encountered, but in the main, heights varied between about 1,000 and 2,000ft. Varase itself is 382 metres (approximately 1,260ft above sea-level). Since one of the aims behind the I.S.D.T. is to put riders and machines to as severe a test as can possibly be devised in six days, the Varase event cannot be described as successful. Time sections(or checks) throughout the week, one after the other, should be so tight that engines and transmission systems, frames and everything else, must be mercilessly thrashed without let-up. Apart from the 15 minutes allowed in the morning the only time for maintenance should be that achieved by riders increasing on the schedule between controls. 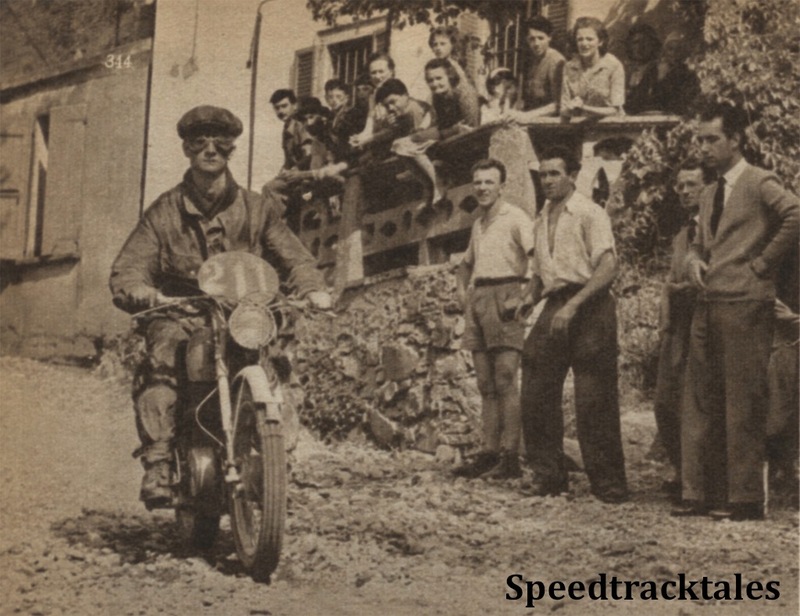 These conditions in this years event were only achieved in part by the Federazione Motociclistica ltaliana. Where the going was sticky it was extraordinarily so, and it was in these really tight sections that the bulk of the retirements and spills took place. Even so, they could have been tighter, because S.B. Manns, of the Vase “A” Team, had a throttle wire break and still checked in on time in the tightest section of the entire week. The speed-test schedules (at Monza Autodrome)were, once again, a favourite topic of discussion at Varase, and there is no question that the trial was easier for riders of small-capacity machines than it was for those using mounts of 350c.c. and over. The degree of difficulty of the event in relation to capacities may be set on a sliding scale, viz. : easy for one-two-fives and one-seven-fives; almost equally easy for two-fifties (but rather hard on one-nine-sevens, which were on the same schedule); and very tough for machines of 350c.c. and over(especially for those on the 10 per cent faster team schedule). So tight, in fact, was the event for the three-fifties that only two on the faster schedule finished. (Both, incidentally, were British Royal Enfields; they were ridden by W. Clark and B.I. Gibson of Ireland.) The wisdom behind mounting our team-men on five-hundreds and six-fifties was therefore well-founded, since, if our riders prefer to ride large-capacity mounts, or if they are forced to do so by our lack of suitable lightweights, their engines should be as big as possible within reason. Reviewing the I.S.D.T. 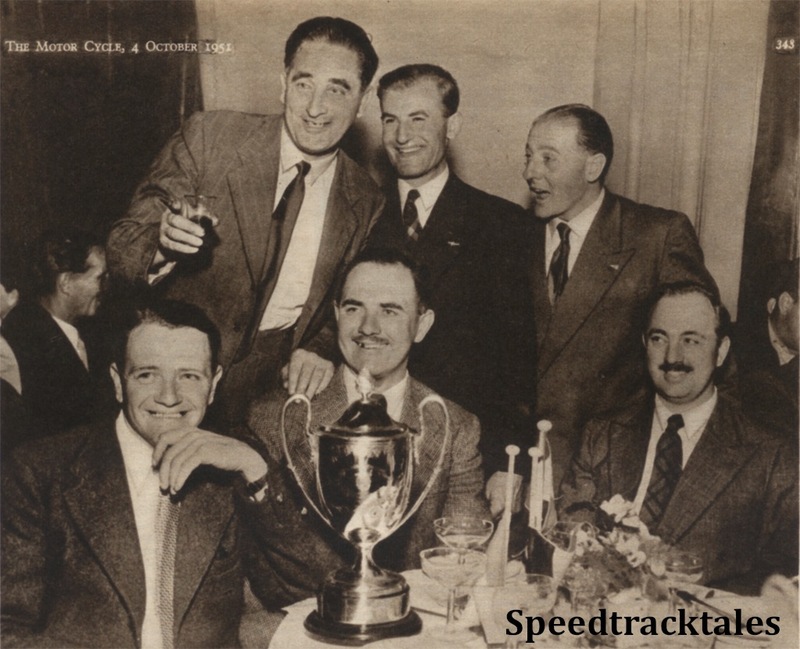 two years ago, when the Vase contest was fought out in the speed test and won by Czechoslovakia, I made the point that unless the speed schedules were altered the stage could be reached where we should have to mount our national teams on lightweights if we were really serious about winning. On the face of things, while some might say that the answer is to alter the schedules to make them fair for all classes, I would reiterate my point. With the tremendous and ever-growing popularity of machines of under 250c.c. capacity in Europe, Continental countries will oppose fiercely any suggestion for increasing lightweight schedules (or decreasing the schedules for larger machines). If next year’s event is held on the Continent, and it is a well-organized trial with tight time sections throughout the week, we shall, I am certain, be extremely lucky to win, for the schedules win be anything but in our favour. Only by getting the event back to Britain next year can we guarantee speed schedules which will give us a fighting chance – and it is not certain by any means that next year’s event will be held here. So, gentlemen, if altering schedules is not possible, and we have no super lightweights to put in the field, where do we go from here? But enough of “politics.” What about the I.S.D.T. machines? That the British mounts performed magnificently there is no doubt. While it is perfectly true that in some cases machines at the end of the week were smothered in oil from stem to stern, the majority were clean enough. The B.M.W.s and Zundapps were by far the cleanest machines in the whole entry, and with their shaft-drive and enclosed unit construction were provocatively tantalizing. Several up-and-coming young Britishers merit special praise. The first is 19-year-old J.V. 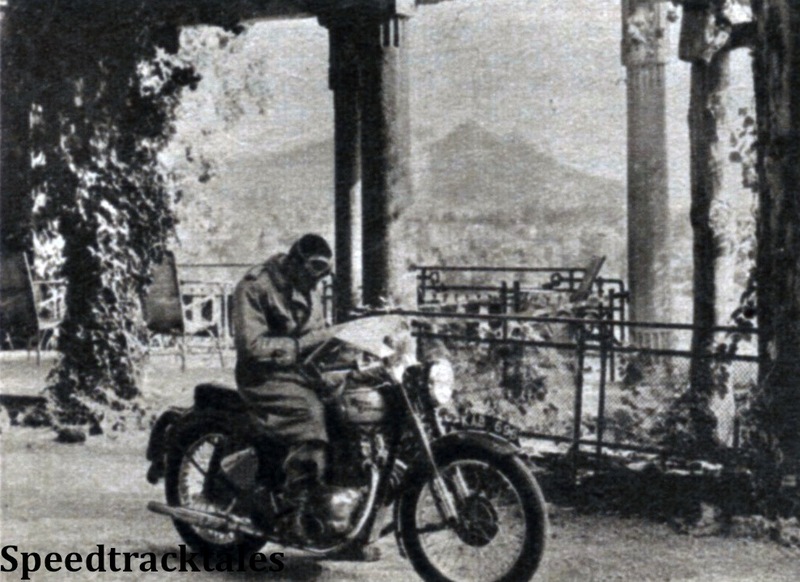 Brittain, son of a famous father, who rode a works’ Royal Enfield at the fast schedule and gained a gold medal. The second is 17-year-old J.V. Smith,Jnr., who rode one of last year’s I.S.D.T. Norton Dominators; and the third is Brian W. Martin (122 Francis-Barnett). All three behaved with the sang-froid, and rode with the speed and dash, of veterans, and I predict a brilliant future for them. An analysis of the provisional results as applying to the nations competing and in relation to capacities is not uninteresting. The tables are given for you to form your own conclusions. The analysis as it applies to capacities is most interesting. My personal mount for the trial was a standard 1952-type Royal Enfield twin. The engine was absolutely magnificent and the experience confirmed my belief that it is one of the best twins in production. Like the competitors, I was using 80-octane-quality fuel, which undoubtedly helped matters and it was just impossible to make the engine pink even with really brutal treatment on the occasions when I wanted dynamic acceleration on short straights. Low-speed engine torque was quite remarkable and particularly appreciated when coming out of loosely surfaced hairpins where too-high r.p.m. causes wheel spin and too rapid opening-up tends to cause the front wheel to slide away. Except on the very tightest of such hairpins,on the steepest of gradients encountered during the week, I could use second gear and accelerate just as hard as necessary. Far from experiencing engine overheating during the week, I found that the exhaust pipes all but entirely retained their pristine brilliance – although quite often the machine was thrashed without mercy. And far from complaining about its treatment, the engine became better and better with every kilometre covered. The tools were used only to top up the rear legs, which were lacking in damping, and to adjust the rear chain twice. And what more can one ask than that?